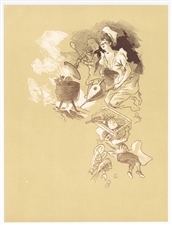 Jules Cheret lithograph "La poule au pot"
Medium: lithograph (after the original lithograph). Executed by Jules Cheret in 1894 for a menu, this edition was published in Paris in 1932 by Arts et Metiers Graphiques. The total sheet measures 12 x 9 1/4 inches (305 x 233mm). Signed by Cheret in the plate (not by hand). Condition: there are some handling creases (bumps to one corner of the sheet). Medium: lithograph. Published in London by "The Studio". This impression on laid paper measures 11 x 7 1/4 inches -- 282 x 185 mm (sheet size). Issued with The Studio blindstamp in the margin. Signed by Cheret in the plate (not by hand).